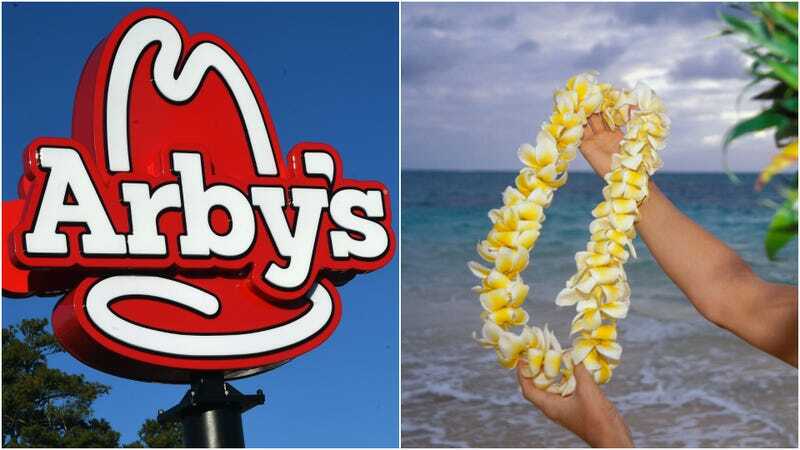 Pro: Arby’s will send the first people who sign up online on April 12 to Hawaii for $6. Con: The entire trip will take place in just 24 hours. Pro: It’s a trip to Hawaii for the price of a sandwich. Con: It’s a really long flight, so wouldn’t you spend most of that one-day trip feeling jetlagged? Pro: Hawaii has amazing food—Spam musubi, poke, mac salad, kalua pork! Con: According to the deal, you would be spending your Hawaii day just eating Arby’s. The promo website states that “Arby’s $6 Hawaiian Getaway flies you to Honolulu to see the sights—all three Arby’s King’s Hawaiian sandwiches. No volcanoes. No pineapple farms. Just you, sweet buns, tender meats, and a Hawaiian paradise to eat them in.” Those sandwiches have titles like Arby’s Hawaiian Big Kahuna and the Sweet & Spicy Luau Chicken. We can live without a volcano or pineapple farm, but isn’t there even a pool? Possibly some sort of beach? What about poke bowls? Con: If you’re chosen, you have to pack up quickly, traveling between April 26 and 28. Pro: You would have an amazing cocktail party story for the rest of your life (“Did I ever tell you about the time I flew to Hawaii for a single day to eat sandwiches for Arby’s?”). To be honest, that would probably be enough to get us to click that little registration link on April 12. We’re not proud.